Are You Ready To Read ? Mums and dads – and nans and grandads – are welcome to join the Malvern Book Group. This is a very informal, social gathering. Please talk to Mr.Kynaston if you’re interested or would like a little bit more information. The Book Group’s next meeting will take place on Thursday 25th April at 7.30pm in The Roby Pub on Greystone Road. Between now and then, we’re (continuing) reading ‘War Doctor: Surgery on the Front Line’ by David Nott and ‘The Cut Out Girl’ by Bart van Es. 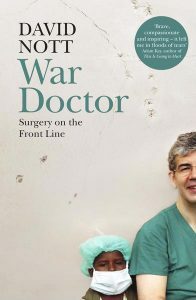 ‘War Doctor: Surgery on the Front Line’: For more than twenty-five years, David Nott has taken unpaid leave from his job as a general and vascular surgeon with the NHS to volunteer in some of the world’s most dangerous war zones. From Sarajevo under siege in 1993, to clandestine hospitals in rebel-held eastern Aleppo, he has carried out life-saving operations and field surgery in the most challenging conditions, and with none of the resources of a major London teaching hospital. The conflicts he has worked in form a chronology of twenty-first-century combat: Afghanistan, Sierra Leone, Liberia, Darfur, Congo, Iraq, Yemen, Libya, Gaza and Syria. 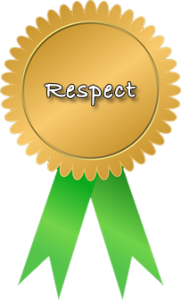 But he has also volunteered in areas blighted by natural disasters, such as the earthquakes in Haiti and Nepal. 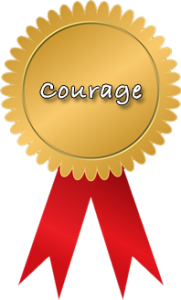 Driven both by compassion and passion, the desire to help others and the thrill of extreme personal danger, he is now widely acknowledged to be the most experienced trauma surgeon in the world. But as time went on, David Nott began to realize that flying into a catastrophe – whether war or natural disaster – was not enough. Doctors on the ground needed to learn how to treat the appalling injuries that war inflicts upon its victims. Since 2015, the foundation he set up with his wife, Elly, has disseminated the knowledge he has gained, training other doctors in the art of saving lives threatened by bombs and bullets. War Doctor is his extraordinary story. 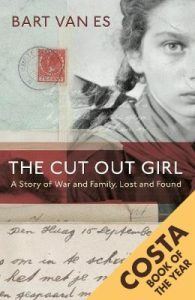 ‘The Cut Out Girl’: Little Lien wasn’t taken from her Jewish parents – she was given away in the hope that she might be saved. Hidden and raised by a foster family in Amsterdam during the Nazi occupation, she survived the war only to find that her real parents had not. Much later, she fell out with her foster family, and Bart van Es – the grandson of Lien’s foster parents – knew he needed to find out why. His account of tracing Lien and telling her story is a searing exploration of two lives and two families. It is a story about love and misunderstanding and about the ways that our most painful experiences – so crucial in defining us – can also be redefined. The Book Group’s last meeting took place on Thursday 28th February at 7.30pm in The Roby Pub on Greystone Road. Since our last meeting, we read ‘Greetings from Bury Park’ by Sarfraz Manzoor. Sarfraz Manzoor was two years old when his family emigrated from Pakistan to join his father in Bury Park, Luton. His teenage years were a constant battle to reconcile being both British and Muslim. But when his best friend introduced him to Bruce Springsteen, his life changed for ever. In this affectionate and timely memoir, Manzoor retraces his journey from the frustrations of his childhood to his reaction to the tragedies of 9/11 and 7/7. 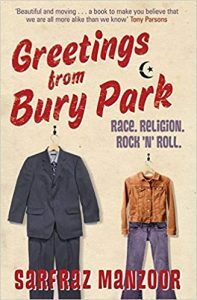 Original, darkly tender and wryly amusing, this is an inspiring tribute to the power of music to transcend race and religion and a moving account of a relationship between father and son. The Book Group’s last meeting took place on Thursday 6th December at 7.30pm in The Roby Pub on Greystone Road. We read ‘Only Child’ by Rhiannon Navin. Amazon says: Heartstopping. Heartbreaking. Heartwarming. 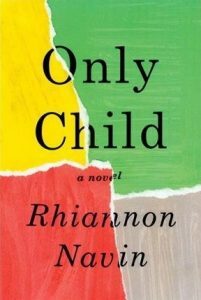 Compelling, compassionate and powerful, Rhiannon Navin’s Only Child is the most heartfelt book you’ll read this year. We all went to school that Tuesday like normal. Not all of us came home. When the unthinkable happens, six-year-old Zach is at school. Huddled in a cloakroom with his classmates and teacher, he is too young to understand that life will never be the same again. Afterwards, the once close-knit community is left reeling. Zach’s dad retreats. His mum sets out to seek revenge. Zach, scared, lost and confused, disappears into his super-secret hideout to try to make sense of things. Nothing feels right – until he listens to his heart . . . But can he remind the grown-ups how to love again? Narrated by Zach, Only Child is full of heart; a real rollercoaster of a read that will stay with you long after you’ve turned the final page. The Book Group met on Thursday 1st December at 7.30pm in The Roby Pub on Greystone Road. 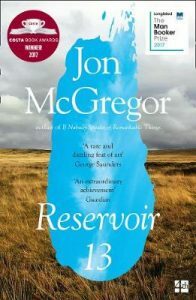 We read ‘Reservoir 13’ by Jon McGregor. Midwinter in an English village. A teenage girl has gone missing. Everyone is called upon to join the search. The villagers fan out across the moors as the police set up roadblocks and a crowd of news reporters descends on what is usually a place of peace. Meanwhile, there is work that must still be done: cows milked, fences repaired, stone cut, pints poured, beds made, sermons written, a pantomime rehearsed. As the seasons unfold and the search for the missing girl goes on, there are those who leave the village and those who are pulled back; those who come together and those who break apart. There are births and deaths; secrets kept and exposed; livelihoods made and lost; small kindnesses and unanticipated betrayals. An extraordinary novel of cumulative power and grace, RESERVOIR 13 explores the rhythms of the natural world and the repeated human gift for violence, unfolding over thirteen years as the aftershocks of a tragedy refuse to subside. The Book Group met on Thursday 4th October at 7.30pm in The Roby Pub on Greystone Road. 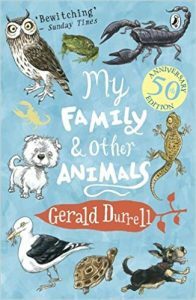 We read ‘My Family and Other Animals’ by Gerald Durrell. My Family and Other Animals is the bewitching account of a rare and magical childhood on the island of Corfu by treasured British conservationist Gerald Durrell. Escaping the ills of the British climate, the Durrell family – acne-ridden Margo, gun-toting Leslie, bookworm Lawrence and budding naturalist Gerry, along with their long-suffering mother and Roger the dog – take off for the island of Corfu. But the Durrells find that, reluctantly, they must share their various villas with a menagerie of local fauna – among them scorpions, geckos, toads, bats and butterflies. Recounted with immense humour and charm My Family and Other Animals is a wonderful account of a rare, magical childhood. The Book Group met on Thursday 6th September at 7.30pm in The Roby Pub on Greystone Road. We read ‘Empty Cradles’ by Margaret Humphreys. 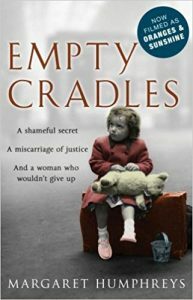 EMPTY CRADLES is a powerful testament to an ordinary woman’s astonishing dedication, compassion and stubborn courage. In 1986 Margaret Humphreys, a Nottingham social worker and mother of two, investigated the case of a woman who claimed that, at the age of four, she had been put on a boat to Australia by the British government. At first incredulous, Margaret Humphreys soon discovered that this woman’s story was just the tip of an enormous iceberg. As many as an estimated 150,000 children had in fact been deported from children’s homes in Britian and shipped off to a ‘new life’ in distant parts of the Empire – the last as recently as 1967. Many of the children were told that their parents were dead. Their parents, too, were often deceived; many believed that their children had been adopted in Britain. The reality was very different: for numerous children it was to be a life of horrendous physical and sexual abuse in institutions in Western Australia and elsewhere. Margaret Humphreys reveals how she gradually unravelled this shocking secret; how she became drawn into the lives of some of these innocent and unwilling exiles, how it became her mission to reunite them with their families in Britain, and how her lonely crusade led to the founding of the Child Migrants Trust. EMPTY CRADLES is a strong indictment of government, as well as charitable and religious organisations. It is a sad, harrowing story that will move the reader to anger and tears. 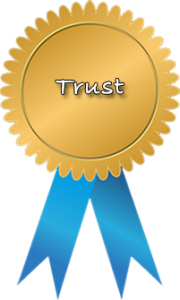 Yet it offers a message of hope to all the victims of a shameful scandal that has been ignored for too long. The Book Group met on Thursday 26th July at 7.30pm in The Roby Pub on Greystone Road. 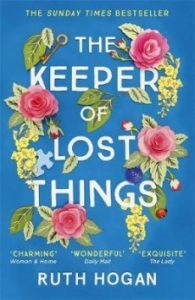 We read: ‘The Keeper of Lost Things’ by Ruth Hogan. A charming, clever, and quietly moving debut novel of endless possibilities and joyful discoveries that explores the promises we make and break, losing and finding ourselves, the objects that hold magic and meaning for our lives, and the surprising connections that bind us. The Book Group met on Thursday 28th June at 7.30pm in The Roby Pub on Greystone Road. 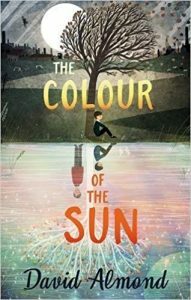 We read: ‘The Colour of the Sun’ by David Almond. This is a moving, funny and inspirational novel from the bestselling author of Skellig. One hot summer morning, Davie steps boldly out of his front door. The world he enters is very familiar – the little Tyneside town that has always been his home – but as the day passes, it becomes ever more mysterious. A boy has been killed, and Davie thinks he might know who is responsible. He turns away from the gossip and excitement and sets off roaming towards the sunlit hills above the town. As the day goes on, the real and the imaginary start to merge, and Davie knows that neither he nor his world will ever be the same again. The Book Group met on Thursday 24th May at 7.30pm in The Roby Pub on Greystone Road. We read: ‘Eleanor Oliphant is Completely Fine’ by Gail Honeyman. But everything changes when Eleanor meets Raymond, the bumbling and deeply unhygienic IT guy from her office. When she and Raymond together save Sammy, an elderly gentleman who has fallen on the sidewalk, the three become the kind of friends who rescue one another from the lives of isolation they have each been living. And it is Raymond’s big heart that will ultimately help Eleanor find the way to repair her own profoundly damaged one. 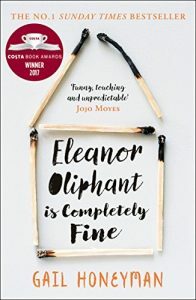 Soon to be a major motion picture produced by Reese Witherspoon, ‘Eleanor Oliphant Is Completely Fine’ is the smart, warm, and uplifting story of an out-of-the-ordinary heroine whose deadpan weirdness and unconscious wit make for an irresistible journey as she realizes. . . The Book Group met on Thursday 26th April at 7.30pm in The Roby Pub on Greystone Road. 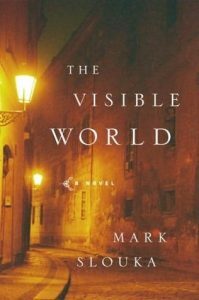 We read ‘The Visible World’ by Mark Slouka as our book for April. Amazon says: ‘My mother knew a man during the war. Theirs was a love story, and like any good love story, it left blood on the floor and wreckage in its wake’. As a boy growing up in New York, his parents’ memories of their Czech homeland seem to belong to another world, as distant and unreal as the fairy tales his father tells him. It is only as an adult, when he makes his own journey to Prague, that he is finally able to piece together the truth of his parents’ past: what they did, who his mother loved, and why they were never able to forget ? The Book Group met on Thursday 22nd March at 7.30pm in The Roby Pub on Greystone Road. 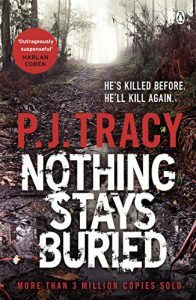 We read P. J. Tracy’s ‘Nothing Stays Buried’ as our book for March. Amazon says: A young woman is murdered in a park in Minneapolis. When detectives Gino and Magozzi discover a playing card near the body, they recognise the work of a serial killer who has already struck the city once before. But it’s worse than they imagined. The card is the four of spades; the last victim’s was the ace: it seems they’re already two murders behind. 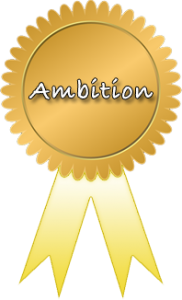 Once again working with Grace MacBride and her team of analysts, they discover a web of evidence stretching back into the past. And there is little time to untangle it: this killer has a taste for blood, and he’s intent on playing out the deck . . . The Book Group met will on Thursday 22nd February at 7.30pm in The Roby Pub on Greystone Road. 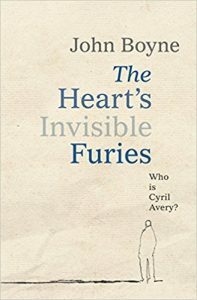 We read John Boyne’s ‘The Heart’s Invisible Furies’ as our book for February. Amazon says: Cyril Avery is not a real Avery or at least that’s what his adoptive parents tell him. And he never will be. But if he isn’t a real Avery, then who is he? Born out of wedlock to a teenage girl cast out from her rural Irish community and adopted by a well-to-do if eccentric Dublin couple via the intervention of a hunchbacked Redemptorist nun, Cyril is adrift in the world, anchored only tenuously by his heartfelt friendship with the infinitely more glamourous and dangerous Julian Woodbead. At the mercy of fortune and coincidence, he will spend a lifetime coming to know himself and where he came from – and over his three score years and ten, will struggle to discover an identity, a home, a country and much more. In this, Boyne’s most transcendent work to date, we are shown the story of Ireland from the 1940s to today through the eyes of one ordinary man. The Heart’s Invisible Furies is a novel to make you laugh and cry while reminding us all of the redemptive power of the human spirit. The Book Group met on Thursday 25th January at 7.30pm in The Roby Pub on Greystone Road. We read Philip Pullman’s ‘La Belle Sauvage – The Book of Dust Volume One’ as our book for Nov / Dec.
Seventeen years after Philip Pullman’s third volume of His Dark Materials trilogy sealed the door on Dust, daemons, witches and armoured bears, a tantalising new chapter now lies open with La Belle Sauvage: The Book of Dust Volume One. 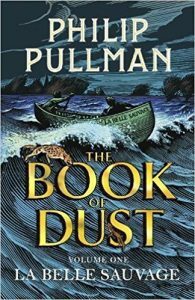 Winding the clock back a decade before the events of the original series, La Belle Sauvage promises the return of Lyra – here still an infant – and the emergence of young Malcolm Polstead, the future academic who suddenly finds himself drawn into the cloak-and-dagger intrigue…. Marcus Sedgwick’s ‘Saint Death’ was our book for October. The Book Group met on Thursday 2nd November at 7.30pm in The Roby Pub on Greystone Road. 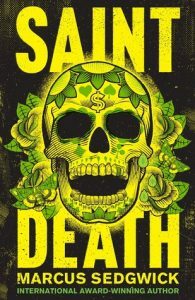 ‘Saint Death’ is a potent, powerful and timely thriller about migrants, drug lords and gang warfare set on the US/Mexican border by prize-winning novelist, Marcus Sedgwick. Anapra is one of the poorest neighbourhoods in the Mexican city of Juarez – twenty metres outside town lies a fence – and beyond it – America – the dangerous goal of many a migrant. Click here for Malvern Primary School term dates.